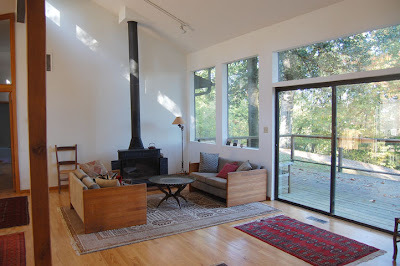 This 4/2.5 MCM by Charles Wagner in Moyaone Reserve is for rent. Moyaone Reserve, is a heavily wooded community of mid-century modern homes near the Potomac River in the Piscataway National Park’s scenic easement. The homes in the community, just 20 miles south of Capitol Hill, were first built after World War II by architects such as Wagner, who was heavily influenced by Frank Lloyd Wright, and Charles Goodman, who designed one his earliest homes for clients in the community. The owners, who were friends with Wagner, worked with him to take maximum advantage of the five acre wooded site and its hilltop overlook of meadow, woods and river. I had the opportunity to see this house a while back – it really is a beautiful house on a great site!